Carry the breathtaking beauty of nature and the power of faith wherever you go with this stunning Footprints in the Sand Tote Bag. 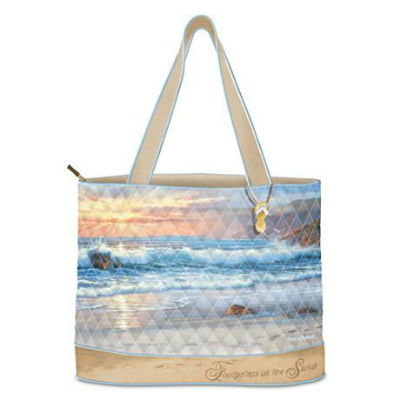 First-of-a-kind inspirational tote bag features uplifting artwork from Sharon Rickert, depicting the beach at sunset with two sets of footprints merging into one. As pretty as it is functional, this gorgeous women’s tote bag is sure to add inspiration and style to every day.